I’ve been playing around with creating new code for blogger gadget backgrounds and found that there is no way to edit your header position with the new templates in the WYSIWYG editor. This little hack does the trick for centering your header and adding additional space (if desired) under the image. Go to Template Designer>Advanced>Add CSS and paste these few lines of code in. You may change the pixel dimensions to suit your needs. If you don’t want any space under your header, just remove the line that says padding-bottom! 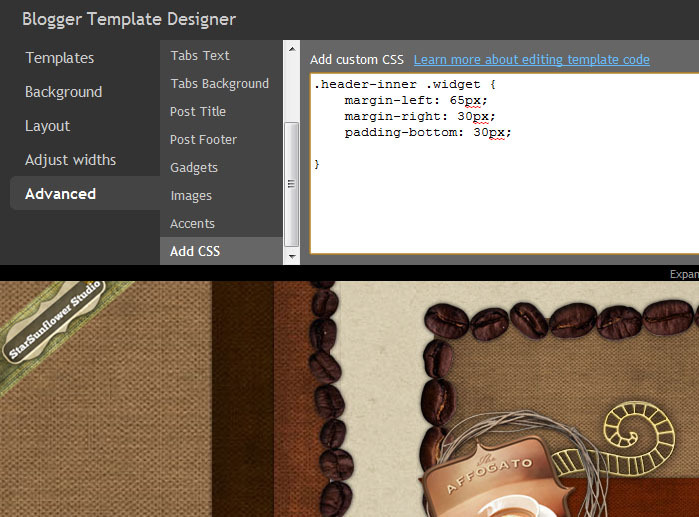 Hope this helps some non-geeks out there who would like to make their blog layout look sweet! CU Freebies Only Forum, Sent Me! Thanks, excellent and very simple to implement.